Direct from Japan, TAO brings explosive Taiko drumming to the San Diego Symphony stage in the brand new show, “Seventeen Samurais,” taking place for one night only on Saturday, March 12, at 8pm. The new show will bring athletic bodies and contemporary costumes combined with amazing drumming and innovative choreography. TAO: Seventeen Samurai has critics raving about TAO’s extraordinary precision, energy and stamina. 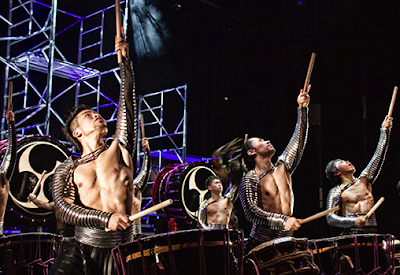 With hundreds of sold-out shows and more than six million spectators, TAO has proven that modern entertainment based on the timeless, traditional art of Japanese drumming, entertains international audiences again and again. Touring with a company of twenty drummers, TAO goes beyond basic Taiko with gymnastic-like movements and choreography. The athletic ensemble blends colorful costumes with exhilarating rhythms for a thrilling modern interpretation of this ancient art form. The men and women of TAO live and train at a compound in the mountains of Japan, reaching the highest level of virtuosity only after years of intensive study. The performers each bring nontraditional flair to the group by drawing on their diverse backgrounds - one as a hard rock musician, another as a gymnast, and another as a composer. With whirlwind martial arts displays and pulsating beats, the drummers bring a young and vibrant style to this authentic show. Tickets for this performance start at $20. Tao: Seventeen Samurais takes place at the Jacobs Music Center Copley Symphony Hall at 750 B Street. Visit sandiegosymphony.org for more information and to purchase passes and check out the preview video below.